Nachos are one of my favorite foods & this nachos quesadillas recipe is a fun twist on a popular appetizer. 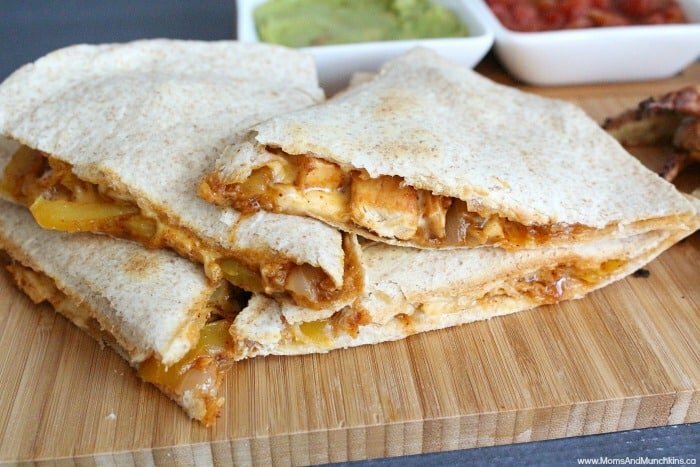 These nacho quesadillas could be served as a party appetizer or as the main family meal. Whenever I go out for appetizers with friends, nachos are always my first choice! In this recipe, I added my favorite nacho toppings (chicken, green peppers, onions) but you can switch it up with your favorites like jalapeños, diced tomatoes, black olives, black beans, bacon bits, etc. This recipe makes a great game day party food! 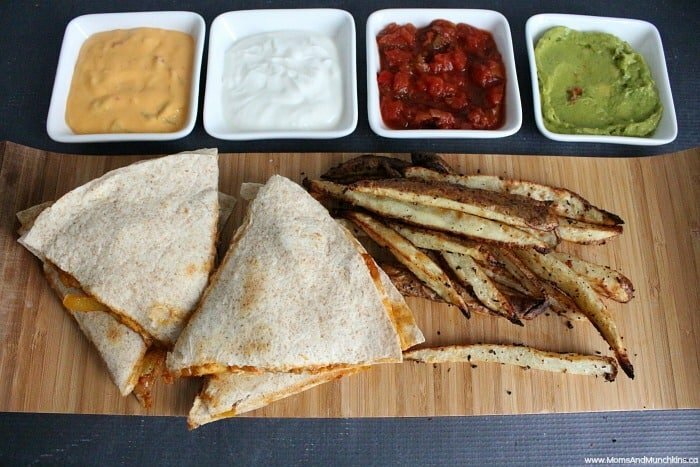 I always serve all dips on the side – sour cream, salsa, nacho cheese sauce and guacamole. Some people put the salsa right in the quesadilla but I find that it makes them too soggy. This recipe makes one large quesadilla – enough to feed 2-3 people as a meal or 4+ people as an appetizer. The fries featured here on the side are my Garlic Ranch Potatoes. Cut chicken into bite-sized pieces & cook in frying pan until brown & cooked thoroughly. Add taco seasoning to chicken according to directions on seasoning package. 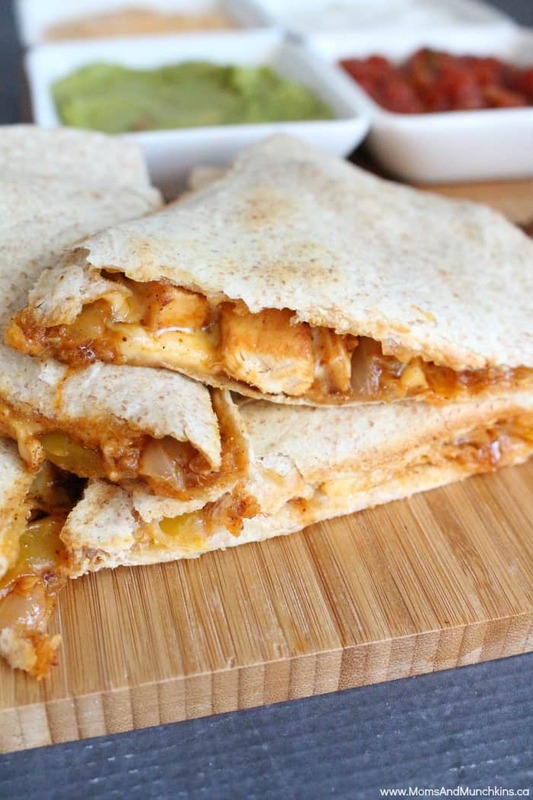 Place one tortilla in the quesadilla maker (or frying pan) and spread chicken over it. Sprinkle onions, green pepper & jalapeños over top. Evenly sprinkle cheese over top. Top with second tortilla and grill until brown & crispy. Serve with sour cream, salsa and guacamole on the side. For more tasty appetizer recipes or family meal ideas, visit our Recipes page. We’re always adding new ideas – follow us on Facebook, Pinterest and Instagram for the latest! Well, looks like I now have lunch plans 😉 This is so simple and so delicious… right up my alley! I hope you enjoy it, Karly!